MicroMagnets: Tiny magnets for sculpting. 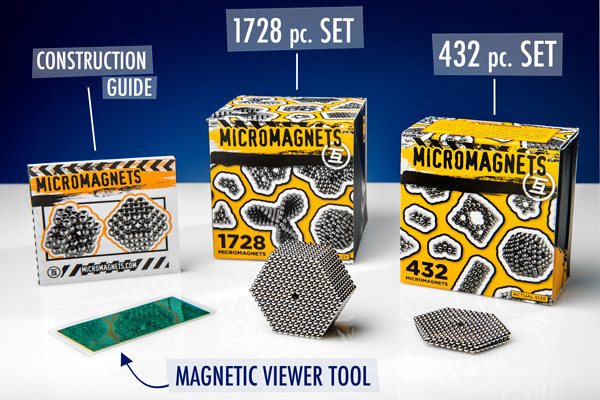 Playing with a single 2.5mm MicroMagnet might not seem like much fun, but when you're playing with hundreds of those magnets, you won’t be able to keep your fingers off of them! When manipulated as a group, these miniscule magnets can be shaped and formed like molding clay made of solid metal. Use the included construction guide to learn the basics of building unique and undeniably-cool metallic sculptures. If you’re not a magnetic Michelangelo, you’ll still love the tactile sensation of those tiny metal orbs on your fingers as you stretch them into a string of neodymium pearls. 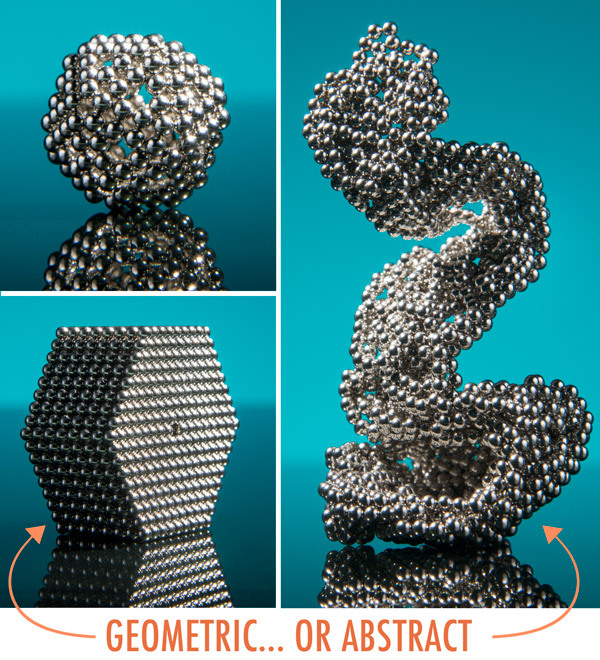 Equally satisfying is the click of neo-balls snapping together as you create amazingly intricate magnetic designs. Available in sets of 432 or 1728 magnets. Available in two sets: 432 magnets and 1728 magnets. Like the atoms that make up our universe—or the members of a boy band—MicroMagnets combine individual components to make a harmonious whole. Building with these tiny pieces lends impressive intricacy to anything you make. While working with the little orbs can be a challenge at times, it makes it all the more satisfying when you complete your shapes. Build small in big ways. You’ll be amazed how much entertainment you can get out of these itty bitty magnets. 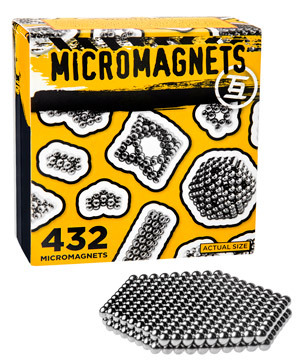 You can craft interesting geometric shapes by precisely placing each magnet to create a three-dimensional figure. Or for those of us without that kind of patience, blissfully knead clumps of MicroMagnets to form abstract shapes and release your stress. However you play, you’ll grow addicted to the sensation of the hundreds of tiny metal massagers running across your fingers. It’s easy to forget that a grouping of these orbs is more than just a cool shape; it’s also a complex interplay among magnetic fields. 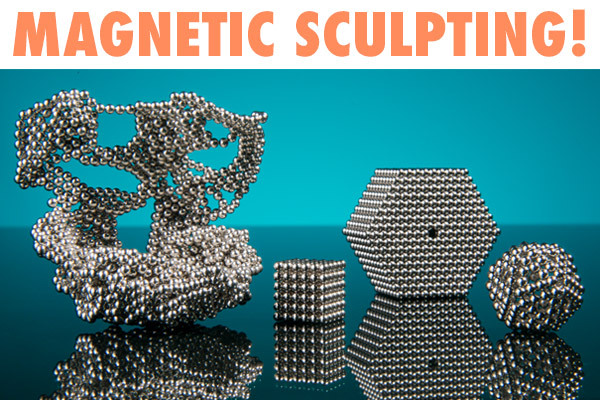 The included Magnetic Field Viewer shows you the polarity of your MicroMagnets, creating fascinating silhouettes when held up to your geometric creations. The Magnetic Field Viewer is also invaluable during the building process. The laminated card cleanly and easily separates clumps of MicroMagnets, allowing you to precisely cut off shapes to attach elsewhere. 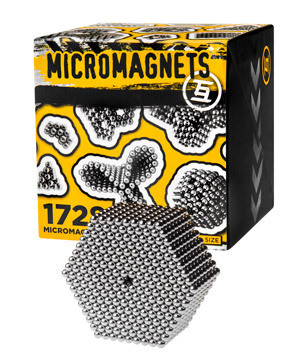 MicroMagnets are available as a 432 piece set and a 1728 piece set. The larger set includes an extra Magnetic Field Viewing card and a metal building platform. Both sets include an instruction manual with a building guide to get you started making your desktop art. Available in sets of 432 and 1728. Answer: MicroMagnets, like any small magnet, are only dangerous if swallowed. 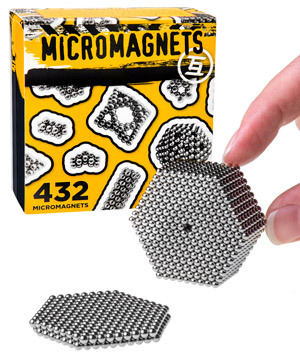 These magnets are designed to minimize harm when ingested, but they should still be kept away from small children and never put in anyone’s mouth. For that reason, the recommended age is 14 and up. Question: How do these compare to other magnetic orbs? 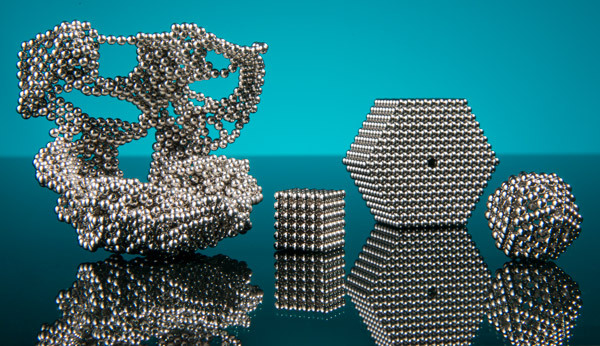 Answer: MicroMagnets are half the size of NanoDots and six times smaller than Mega NanoDots. Their small size makes them more challenging to manipulate than NanoDots but provides a uniquely detailed tactile sensation. Magnetic toolkit for scientific exploration and creative play.